Raheem Sterling will be happy at Liverpool "as long as he is playing regularly", says team-mate Daniel Sturridge. The 20-year-old England international told BBC Sport he had rejected a £100,000-a-week contract and will discuss his future in May. 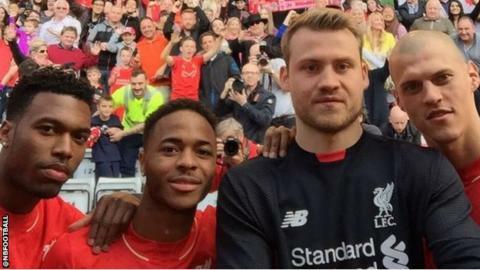 At Liverpool's 2015-16 kit launch on Friday, one fan told Sterling: "Make sure we see you in it next season." "It is important to play games and gain experience," said Sturridge, 25. "Whatever decision he makes, I am behind him 100%." Sterling, who has scored 17 goals in 89 Premier League matches since making his debut in March 2012, has two years remaining on his current deal. Former Manchester City and Chelsea striker Sturridge said: "As long as he is playing regularly he will be happy - I don't think it is anything to do with anything other than that, and I hope he will stay at the club. "It is important, regardless of who you are, to show what you can do, not just for Raheem but any young player."